We have a lot to be proud of here in Virginia. And we are very proud of our Rising Stars! Virginia students who are working hard to improve our nation's standing in Science, Technology, Engineering and Math (STEM). Each year, thousands of students in Virginia conduct scientific research, develop innovative solutions to world problems, and compete in statewide and national STEM competitions. Recently, eight Virginia students were chosen as semi-finalists in one of the nation's leading STEM competitions, the 2103 Broadcom MASTERS. 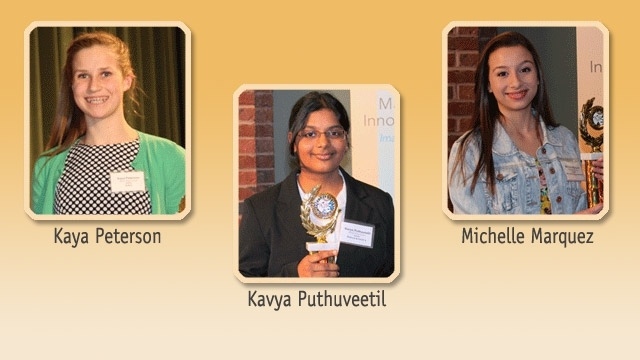 Meet Central Virginia's three semi-finalists- Kaya Peterson, Kavy Puthuveetil and Michelle Marquez in this special WCVE FM radio report by John Ogle. The Broadcom MASTERS®, a program of Society for Science & the Public, is the preeminent science and engineering competition for 6th, 7th and 8th graders in the United States. Now in its third year, the Broadcom MASTERS (Math, Applied Science, Technology and Engineering for Rising Stars) is inspiring middle school students from all walks of life to pursue math and science throughout high school, opening doors to exciting university and career choices in STEM fields. To compete in the Broadcom MASTERS, students in Central Virginia must first compete and place in the Metro Richmond STEM Fair- our regional qualifying fair for both the Intel International Science and Engineering Fair (Intel ISEF) and the Broadcom MASTERS competition. The Metro Richmond STEM Fair is entering its 22nd year and is funded by the MathScience Innovation Center (MSiC) and the MSiC Foundation. Click here for a listing of the Metro Richmond STEM Fair winners in 2013. I'd like you to meet Central Virginia's 3 semi-finalists and learn more about their projects and their experiences in STEM competitions - in their own words. Kaya Peterson was in the 8th Grade at George H. Moody Middle School, Henrico County Public Schools when she competed in the Metro Richmond STEM Fair and advanced to the Broadcom MASTERS. The name of my project is "The Effect of Day Rhythm on the Algal Mitotic Cycle and Yield" which is more simply the effect of how long a day is on how much algae is produced. I chose this project because it is very relevant. Algae contain oil and can be pressed to create biofuel which is a renewable alternative fuel source to fossil fuels. With fossil fuels being detrimental to the environment and rapidly depleting, I thought it was very important and interesting to learn more about ways to make algae biofuel production more effective. I ended up finding that a twelve hour day (six hours of light, six hours of dark) was a cheap way to increase algae production by 64% so I was excited to have found a way to improve biofuel production! What is it like to compete in STEM fairs and the Broadcom Masters? I find it very rewarding to compete in these fairs especially because I want to pursue science in the future. Although winning things is great, these science fairs also have helped me grow and gain more experience as a scientist. Just between 7th and 8th grade, I noticed a huge improvement in my abilities because they require more effort than a normal science class experience. These large, hands-on experiments are hard work but they are a more realistic idea of what I'm going to be doing in the future. I was very lucky to go to Moody where they had kids do projects. I was nervous the first year for these science fairs but I found that they're tons of fun and even if you don't win at first, keep trying and no matter what, it's a great experience. Every time you get better, and it's a great way to go more in-depth on topics that interest you. I chose this project for two main reasons. The first being my experience in FLL(FIRST LEGO League). Last year's topic was Senior Solutions and I had briefly researched the issue of non-adherence to medication rules. It immediately sparked my interest and I decided to base my project on this topic. The second reason is because I have a personal connection to the topic. Late last year, I had to get a surgery to remove by wisdom teeth. I had many medications, all of which had to be taken at different times. It was really difficult to cope with and I ended up being unable to manage it by myself. Though my experience was not even close to being as life threatening or dangerous as a senior's, I felt like I could relate. I thought that by creating a new, more efficient reminding strategy, I could enhance the lives of seniors. Michelle Marquez was an 8th Grader at Robious Middle School, Chesterfield County Public Schools during the Metro Richmond STEM Fair and advanced to the semi-finals with her project "Music, Emotions, Time." What personal experiences or challenges impacted your choice of this project? During a family dinner conversation, we were discussing the different types of physical-dimensions. I thought to myself, "What are the dimensions of things that you cannot physically feel or touch? Including dreams, emotions, or even music?" The conversation evolved into a discussion about the lack of science behind non-traditional therapies (music, aroma, and meditation therapies) to treat PTSD, ADHD, etc. My fundamental question was that if the dimensionality of the stimuli can be, in some way, scientifically designed to achieve a selective-emotional state, what would be the result. Thus, my journey began in this project by searching for my answer. Who inspired you to do this project and why? My inspiration does not necessarily come from a particular person. The origin of my inspiration comes from my curiosity about the obvious relationship between sounds, emotions, and perceptions as well as trying to figure out a way to scientifically measure that which is untouchable. I believe that there are unexplored scientific foundations behind the accepted aftereffects of music/aroma/meditation therapy to help the reduction of depression and pain. The ability of neuroscience to answer the questions “why” and “how” for human behaviors from the biological point of view is what initially captured my interest. The Broadcom MASTERS awards cash prizes and gifts to all MASTERS nominees and their teachers. The national finals will be held in Washington, D.C. and the winners will be announced on October 1st. Click here for the List of 2013 Finalists. Thinking about competing in a Science Fair this year? If you are in the 7th and 8th grades and would like to enter your science or engineering project in the Broadcom MASTERS you must first compete at regional and state SSP-affiliate fairs in Virginia. Click here to find an affiliated Science Fair In Virginia. For more information on the Metro Richmond STEM Fair 2014 click here. You can also check out these links "Science Fairs: What's a Parent to Do?" and MSiC's STEM Fair Resources links. Discover more stories like this at Science Matters, and like us on Facebook.